Ayn Rand was a Russian-American novelist, philosopher, playwright, and screenwriter. She is known for her two best-selling novels The Fountainhead and Atlas Shrugged and for developing a philosophical system she called 'Objectivism'. "My philosophy, in essence, is the concept of man as a heroic being, with his own happiness as the moral purpose of life, with productive achievement as his noblest activity, and reason as his only absolute." 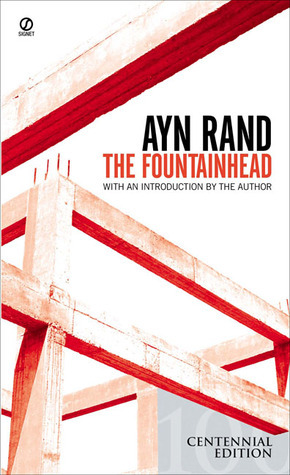 When it was first published, The Fountainhead- containing Ayn Rand's daringly original literary vision with the seeds of her groundbreaking philosophy, Objectivism- won immediate worldwide acclaim. This instant classic is the story of an intransigent young architect, his violent battle against conventional standards, and his explosive love affair with a beautiful woman who struggles to defeat him. This edition of The Fountainhead, celebrating the controversial and enduring legacy of its author, features an afterword by Rand's literary executor, Leonard Peikoff, offering some of Ayn Rand's personal notes on the development of her masterwork, and a Reader's Guide to her writings and philosophy. "Howard, I’m a parasite. I’ve been a parasite all my life . . . I have fed on you and all the men like you who lived before we were born. . . . if they hadn’t existed I wouldn’t have known how to put stone to stone. . . . I have taken that which was not mine and given nothing in return." Breathtaking, mind boggling, awe-inspiring: three words that pretty much sum up what this book is all about. It's the take of a woman like no other, on the essence of man's existence. This novel takes you on a journey you will never forget. Here is an author who emphasizes on the need for selfishness and egotism. It's a notion you might be reluctant to accept, no matter how broadminded you may be. But give this book a read and you'd want to worship this woman for her sheer genius. Howard Roark, quite apart from being machismo personified, is a person who lives for himself- a man as man should be. He is someone who refuses to go by the outdated traditions that society imposes on him. He gets expelled from his school of architecture because he does not conform to their ideas; his buildings reflect his individuality, and even later in life when he finds work for himself, he faces terrible problems since he does not oblige the demands of his clients. Roark stands for the ideal man; he is 'selfish'... in other words, he has a SELF. The anti- hero in the plot is possibly the greatest villain ever penned down. I have never come across such a character in any book I have read- or heard of- so far. He goes about his agenda with staggering brilliance. You'll begin with admiring him beyond words and as you'll gradually realize his ulterior motives, his true self will leave you thunderstruck, as will the foolproof shield that he uses to defend his words and actions. The most horrifying fact is that such a person might be present in your own life, and you might never have realized it. I won't give away his name or that would just ruin the effect. Gail Wynand is the man who has as much talent and potential as Roark- but he is one of those who give up on their sense of idealism in order succeed in this world. However, he is the tragic figure in the novel: when he finds the inspiration to go back to his ideals, the world does not allow him to be who he really is. Peter Keating is the good looking boy who gets the highest score in the very same school which Roark was expelled from; the boy who gets the best job, the best looking woman... the boy who ultimately ends up as a nobody because he lacks real talent in the field he chose. He is the kind of guy who gives up on his passion to pursue the career that others think he should. One would have pitied him had it not been for his false sense of superiority..which gives way to the real side of him. Incidentally, the excerpt is a part of his speech. His former fiancee on the other hand, brings to light a shocking aspect of altruism- perhaps, the aspect which is most prevalent in society yet we never recognize it. One of the most phenomenal heroines ever, Dominique Francon is a woman who tries to destroy all that she treasures. Quick witted, gorgeous and exceptionally intelligent, she is convinced that greatness cannot survive in this world. She is perhaps the only woman who could ever be fit for a man like Roark, just as Roark is the only man who could fulfill her. It's a book I would recommend to each and every person; hell, I'd say this ought to be taught in class! If there was ever a novel that explored the human psyche, it's this one. It couldn't have been more true to life, more enlightening. Get this the first thing the next time you enter a book shop. It's bound to leave you awestruck. one of the best books i've read and own. This is one of the greatest treasures! ADDED TO THE CART, THEN AND THERE! !